Judy Pascale is energetic and inspiring. Judy Pascale is a life long knitter who launched her career as a professional knitting instructor and designer in the early 1990's. Judy Pascale has professionally sold her unique knitwear under the name THE JUDITH COLLECTION both privately and at juried shows. Judy teaches professionally an emphasis on customizing desired fit. Judy Pascale calls Middletown, Connecticut her home. 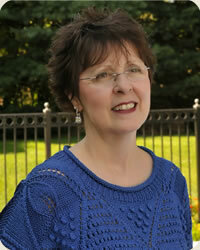 Judy Pascale has been teaching all levels of knitting for many years. Her teaching experiences include the XRX Stitches Conventions held through out the country. Judy Pascale has also taught at The National Needleworks Association (TNNA) and The Knitting Guild of America (TKGA) Conventions as well as numerous workshops at an array of different yarn shops and guilds. This will be Judy Pascale's third knitting cruise. Judy is an active member of the Nutmeg Knitters and the Soundview Knitting Guild both in Connecticut and the Big Apple Knitting Guild in New York.